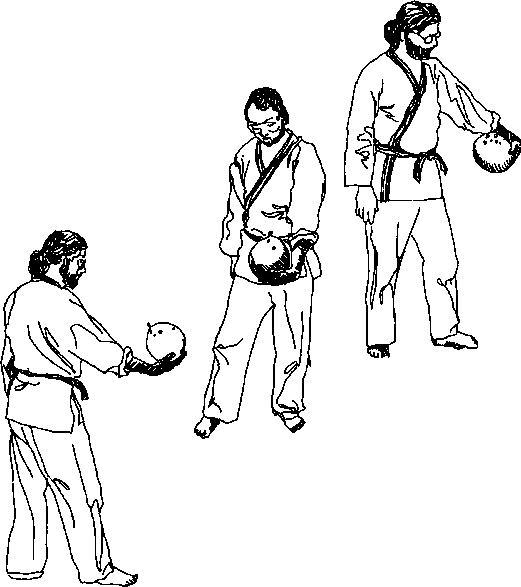 This is a very popular throw and forms part of the repertoire of most judomen. One reason for it's popularity is that it is almost impossible to counter. It is also possible to do it when the opponent is standing still, moving forward, sideways or backwards. It is most used as a forward throw which I will describe here. Stand in the right natural posture with your right foot about midway between your partner's two feet. Swing your left foot round and out about half in front of your partner's left foot. As you swing your left leg pull very strongly with your arms to the opponent's right front corner. This should make him stagger forward with his left leg flying up into the air. Having put your left foot on the ground take one more short step with the right foot so as to make a trip for your partner's right leg. The position of your right leg is important. Your ankle should fit snugly into your partner's ankle. Your weight should be now spread evenly between your two legs. If you find that your right leg is dangling in the air - something like Harai-goshi - you are doing it wrong. If necessary when you make the step with your right foot lean into it so that most of your weight is on the right foot. Remember this is a hand throw. The arms which started by pulling forward never let up. The thrower's right leg is nothing more than a trip wire. 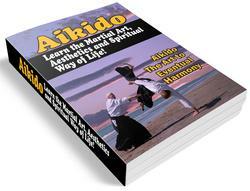 The arms and shoulders start and finish the throw by whirling the man to the mat. If the throw is done slowly it will be difficult to get the arm action. All the actions of the arms, leg and body should blur into each other in one thunder-clap of a throw. To get the arm action right, start by moving your body into position without moving the right leg across. Practise turning the man into the mat just with your arms alone. Once you find this can be done successfully start moving your right leg across. If you find that you are having to use your right leg to sweep or hook to get your man over go back to practising with the arms alone. My teacher in Japan once described the leg action in tai-otoshi as an afterthought. The man should be almost thrown before you use the trip.